Drepung monastery, the largest and richest monastery in Tibet, was built in 1416 by a disciple of Tsongkhapa, founder of the Yellow Hat sect, under the patronage of a noble family, and enlarged by the 5th Dalai Lama later. Its name means ‘Rice Heap’ in Tibetan. The monastery covers an area of more than 200,000 square meters. At its peak, it had over 10,000 monks. The main parts of the monastery are the assembly hall, four tantric colleges (Loseling, Ngapa, Deyang and Goma) and Ganden palace (Ganden Potrang). The assembly hall, 4,500 square meters in area and supported by 183 pillars, is located in the center. Gilded effigies of Sakyamuni are enshrined in the hall. Upstairs, a collection of ancient scriptures are kept. Next to the hall is a small chapel in which a bronze Jowo Maitreya aged 8 together with a conch shell are worshipped. It is believed the shell was used by Sakyamuni himself and hidden at Mt. Gambo Utse. It was later discovered by Tsongkhapa who gave it to his disciple to be the monastery’s treasure. Ganden Potrang used to be the living palace for the Dalai Lamas before the reconstruction of Potala palace in 1653 by the Great 5th Dalai Lama, and was built by the 2nd Dalai Lama. Ceremonies are held in the courtyard of the palace on the first day of the grand Shonton Festival. 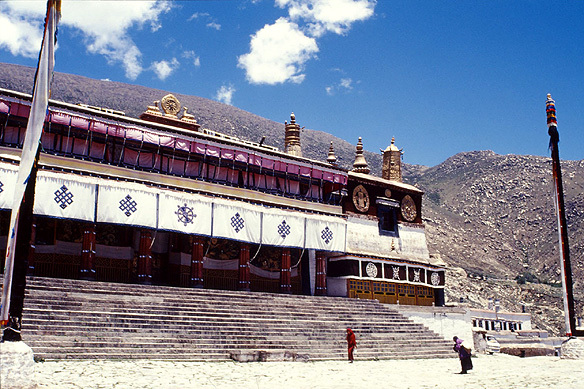 Sera, one of the three largest monasteries of Gelugpa, is as prestigious as Drepung and Ganden. Sera in Tibetan means ‘Wild Rose Garden’ since opulent wild rose woods once grew around it. Legend recounts that Tsongkhapa and his two disciples once heard a horse whinnying underground whilst they were taking a walk in the rose woods. A statue of Hynagriva (a horse-headed demon-god) was dug out for which Tsongkhapa then built the monastery. History on the other hand states that in 1414 Jamchen Chojey (or Sakya Yeshe), one of Tsongkhapa’s disciples, visited the Emperor Chengzu on his behalf. The Emperor gave the founder the title ‘Dharma King of Great Mercy’, along with sutras and a set of sandalwood Arhats. Tsongkhapa suggested to Jamchen Chojey that he build a monastery to house these treasures. Sera monastery was consequently established in 1419. The center of Sera is the main assembly hall, or Tsokchen in Tibetan. The four-storied hall has a huge Maitreya which dates to the reign of the 7th Dalai Lama. The Buddhist sutras Jamchen Chojey brought back are kept in the sutra pigeonhole against the hall. Sera has three colleges, namely, Sera Me, Sera Je and Ngagpa. The effigy of Hynagriva that was found in the woods is enshrined in the Hynagriva Chapel in Sera Je college. Ngagpa college was set up last in 1559 and is the smallest of the three. It houses its founder, Jamchen Chojey’s statue in its chanting hall and the set of sandalwood Arhats granted to the monastery. To ensure posterity, the Arhats were placed in the bellies of clay Arhats, the exact likenesses of the originals. The main chapel houses a dorje said to have flown to the monastery from India. This sacred object is displayed to the public in a festival called the Sera punche, which takes place before the Tibetan New Year. 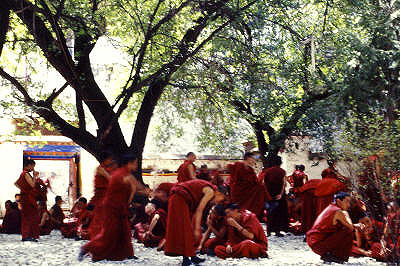 A unique feature of Sera monastery is the debating that takes place amongst the monks every afternoon for two hours in an enclosed yard. The monks question each other on the minutest and most profound subjects in Buddhism. It is quite a sight as the monks hurl questions, putting one foot forward, arms stretched out to the seated monks, clapping, giving just a moment or two for the answer before declaring the questioned monk to have won or lost. Norbulingka or Treasure Park, was built in the 18th Century and covers an area of 40 hectares. Kalsang Potrang, the oldest palace within the park was built by the 7th Dalai Lama in 1751. The 14th Dalai Lama lived in this palace before the Daktan Migyar Potrang, more commonly called the New Summer Palace, was completed in 1956. Before 1959, common people had no access to the Norbulingka. The New Summer Palace is a traditional Tibetan palace except for modern facilities within. The inside walls are decorated with murals painted by the 14th Dalai Lama’s painter. Mural themes include Tibetan officials, Sakyamuni preaching under a Bodhi tree, and Tibetan history from its founding by the Holy Monkey, the victories of the Tubo Kingdom (633-844) and Tibetan Buddhism, to the Panchen and Dalai Lama’s interviews with Chairman Mao Zedong in Beijing. The present Dalai Lama’s private apartments are on view. The Dalai Lama’s throne, wrapped in gold foil and gems, sits in a little sutra hall. There is that same air of melancholy here as the one in the palace of the Panchen Lama in Shigatse. An air in which time stands still in a moment of history, when history itself was grasped and separated from itself. In the eyes of the Tibetans, the Dalai Lama and Panchen Lama, considered to be reincarnations of Avalokiteshwara and Amitabha respectively, are deities as well. Even though now absent from Tibet, the Tibetans believe that everything associated with them still retains their divine spirit. It is, thus, common practice for Tibetans to circumambulate around their palaces, kneel before the empty thrones and bow before their images. For them, a pilgrimage encompasses both monasteries and the palaces. Their gods include Sakyamuni and the Dalai and Panchen Lamas. This entry was posted in Exploring our World, Tibet and tagged 14th Dalai Lama, 5th Dalai Lama, Amitabha, Avalokiteshwara, Buddhist Monastery, Debating Monks, Drepung Monastery, Hynagriva, Lhasa, Norbulingka, Sera Monastery, Sera Punche, Shonton Festival, Tantric Buddhism, Tibet, Tibetan Buddhism, Tibetan Festivals, Tsongkhapa, Yellow Hat Sect by Rama Arya. Bookmark the permalink.